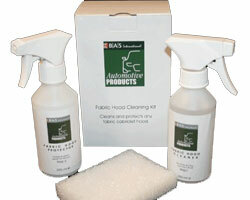 BAS Fabric Hood Cleaner is quite simply the best way of maintaining your Mohair Cabriolet roof. The kit comprises of a hood cleaner (250ml) application sponge (for initial cleaning) and hood protector spray (250ml) to help stop dirt from penetrating the cloth. This kit was developed specifically for cleaning Mohair cabriolet roofs and re-proofing them. Used correctly, they can protect and preserve your cabriolet hood, extending its life whilst keeping it looking clean and fresh.